Direct to Garment and Dye Sublimation Printing on Shirts, Bags and More! Digital technology continues to change the world every day and textile printing is no exception. These two relatively new print technologies have enabled Tower media Group to offer full-color printing on a wide variety of wearables and other textile products in quantities as low as just one piece! 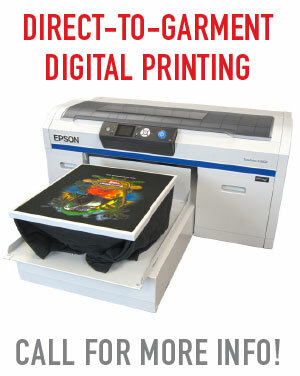 Direct to Garment Printing uses advance ink-jet printing technology to image directly onto a shirt, tote bag or other flat material with a digital flat-bed printer. The results are stunning and yield the same results as high-end color silkscreen printing without the costly set-up expanses of films and screens. 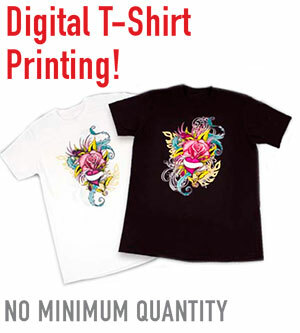 The average price for a single full color direct to garment shirt is about $18 on white and $22 on a black shirt. Dye sublimation Printing uses heat to open the pores of polyester based textiles and products to accept sublimation dye that converts to a gas. While the poly pores are open the gas enters and fills the material with dye. As the product cools, the dye literally becomes a part of the material. Unlike screen printed images, a sublimation print will last as long as the material does. You literally have to wear out the material to see any deterioration in image quality.